Primates are essentially tree-dwellers, although many lack the remarkable agility of certain South American monkeys and the gibbons. Anatomical changes to permit this kind of activity include grasping hands and feet in which the thumb or big toe may be opposable, flat nails instead of claws and sensitive tactile pads on all digits, and in hominoids, a very mobile shoulder joint and elbow so that the arm can be rotated in a complete circle. Primates have larger brains, in proportion to body size, than all other terrestrial mammals. In addition, the eyes are generally large and close together on the front of the face and the snout is reduced. The flattened face of most primates allows them to look forwards and to have a large amount of overlap between the fields of vision of both eyes, which makes stereoscopic, or three-dimensional, sight possible. Primates use their stereoscopic vision to judge distances when they leap from branch to branch, and the enlarged brain allows them to cope with the variety of forest life and social interactions. 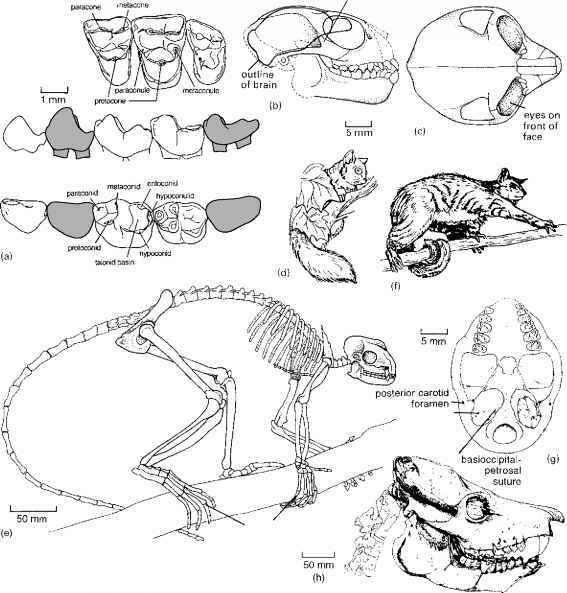 Turning to the cranium, primates have a postorbital bar (Figure 11.2(b, c)),a division between the orbit and lower temporal fenestra, which is absent in related mammals (see p. 354). 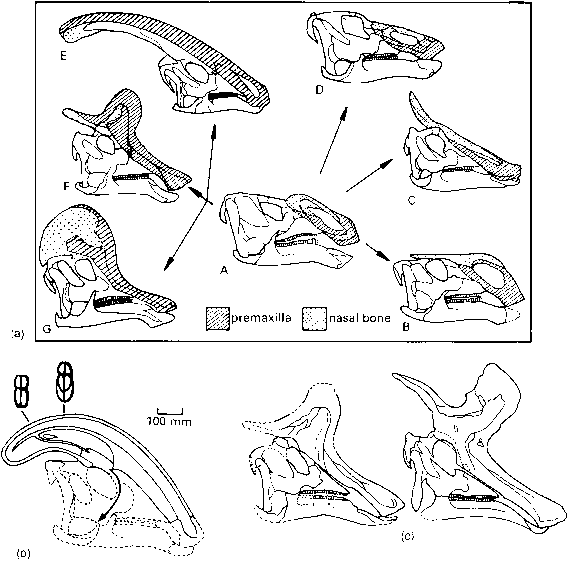 Furthermore, the auditory bulla, the bony capsule that encloses the middle ear and other structures (Figure 11.2(g)) in primates, is large and it is composed mainly of the petrosal bone (see p. 299). The third set of derived characters of the primates relates to improved parental care of their offspring. Primates usually have only one baby at a time, the foetus is retained longer in the womb than in other mammals of the same body size and there is an extended period of parental care of the offspring. In addition, primates usually have only two mammary glands. Sexual maturity comes late and the total life span is long relative to other similar-sized mammals. Primates have opted for a high parental investment approach, which may have been essential so that the young could learn the complexities of forest life.